Property Size 650 sq. ft.
Durango Colorado vacation rental condo in Historic Jarvis Building on Main Avenue in downtown Durango. This building is on Main Avenue, which means guests are a short walk away from many of Durango’s finer shops, galleries, restaurants, the Durango Train and the Welcome Center, which holds a myriad of traveler information. Excellent location! Historic downtown Durango Colorado on Main Avenue in the heart of the old town area with restaurants, shops, the Durango Train Depot and entertainment. This modernized, historic, loft condo is comfortable, hip and in the middle of all things Durango. With touches of the old brick building exposed as an architectural statement, a modern kitchen with contemporary appliances and oversized, full bath, plus custom touches like tile decor in the bath, granite countertops, custom cabinetry, a large flat screen cable TV and WiFi, this new-meets-old condo is the perfect spot for activities in downtown Durango and the entire area, with an essence of style and cozy comfort. Arrival at the home begins with a private, reserved, off-street parking space dedicated to this condo which eliminates the challenges of downtown parking. The entrance to the building is immediately across the street from the parking lot, and the front door is secured by coded entry for after hours access. Inside the lobby designed with Victorian style, is the elevator that delivers guests to the upper floor where this condo is located on an interior hallway. Inside the home, guests will find a stylish, updated kitchen complete with modern appliances, cookware and tableware, and dining on the granite countertop island. The open floor plan includes the kitchen, dining and living room which includes a computer desk for those who need a little work space while traveling. Also in the living room is a large, flat screen TV, leather sofa, sitting area and south-facing windows for a light and bright room during the day. The new, king sized bed at the end of the living room allows guests the convenience of one-level living, plus there is an optional loft bedroom. The bathroom, also on the main level in this condo, is surprisingly roomy for an urban condo, and is quite elegant with a large tub, oversized walk-in shower, and stylish vanity with enough room for dressing, all adorned with custom tile and flooring to add to the upscale experience of comfort and luxury in this quaint downtown setting. The loft bedroom is reached via stairs at the end of the living room leading to a sleeping area with king size platform bed in a unique loft setting. This is a very comfortable space to call a sleeping chamber, but please be aware that there is a very low ceiling and guests cannot stand up in this room. As an option to the elevator, guests can conveniently reach Main Avenue via the exit-only stairs just a few feet from the condo. Outside this door, is the sidewalk at the corner of 10th Street and Main Avenue, where travelers are in the midst of Historic, downtown Durango, surrounded by restaurants, shopping, art galleries and entertainment. The Durango & Silverton Narrow Gauge Railroad and Museum (The Durango Train) is five blocks walking distance from this spot. The Durango Welcome Center, with an abundance of visitor information, is two blocks walking distance at the corner of 8th Street and Main Avenue. We’re not exaggerating when we say ‘in the heart of downtown Durango’. 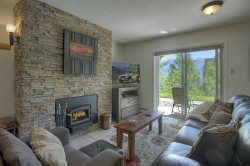 Whether visiting for events, festivals, holidays, a weekend getaway, student activities at Fort Lewis College, a business trip or simply wanting to experience the trappings of a fun, old, Victorian mining town turned tourist destination, this condo is extremely convenient for many travelers. Skiing and summer activities at Purgatory Resort are a scenic 30 minute drive to the north, and Mesa Verde National Park is about a 44 drive through the foothills of Southwest Colorado. Please contact us to find our more details and information about this unique vacation rental condo in downtown Durango, Colorado. The property manager was easy to get a ahold of when we arrived in Durango early. We were able to check in before our original check in time. Our stay was nice, but we had some really loud neighbors next to us that were yelling and playing music late into the night. Also the water heater doesn't stay hot for very long, so we were unable to fill the tub with warm water to use. Quick and responsive and very easy to work with. We loved every minute of it! It was very easy to get to, right in the heart of downtown Durango, amenities were clean and abundant. Marie was great to work with. My only complaint is that I did not like the bed pillows very much.